Nigel Richards (right) with Chris Cree, co-president of North American Scrabble Players Association, after Richards won the 2012 national championship. LeBron. Peyton. Tiger. Serena. Nigel. 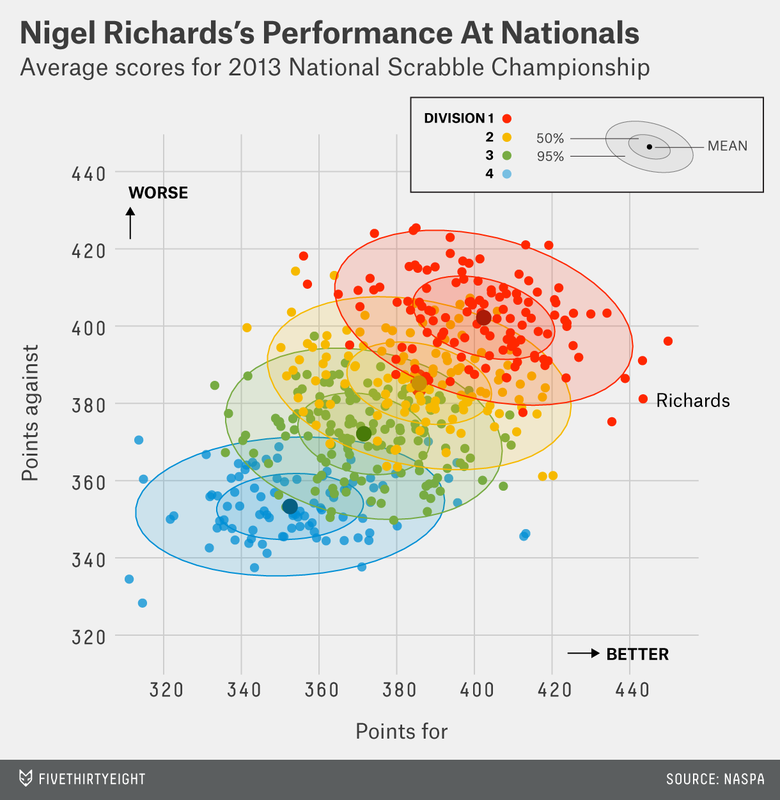 When the 2014 National Scrabble Championship begins Saturday in Buffalo, New York, the odds-on favorite will be a 47-year-old New Zealander who resides in Malaysia named Nigel Richards. He is currently ranked first in North America. The difference between his official rating and the second-place player’s is about the same as the difference between second place and 20th. He has held the first or second ranking on the continent since 2002, the year of his first National Championship. He holds the record for the highest Scrabble rating ever achieved. He is such an overwhelming favorite this weekend that a popular fantasy Scrabble rotisserie competition places him on participants’ selected teams automatically. Beyond all that is the sheer virtuosity of his gameplay, his uncanny gift for constructing impossible words by stringing his letters through tiles already on the board. The ultimate Richards word story: In a game in 1998, then-newcomer Richards had a rack of CDHLRN? (“?” denotes a blank tile). There was an E available on the board; Richards could have played CHILDREN for a bingo and a 50-point bonus. Instead, Richards played through two disconnected Os and an E. The word? The 10-letter CHLORODYNE. Everybody knows Scrabble, that old chestnut of a board game, played on rainy afternoons at grandma’s kitchen table. You draw seven lettered tiles from a bag initially containing 100 — 42 vowels, 56 consonants, and two wild-card blanks, each with an associated point value — and you take turns making words on the board, a 15-by-15 grid. Bonus squares enhance the value of your plays. You replenish your rack after each turn until the bag is empty (or until your little brother flips the board in anger), and the player with the most points at the end wins. Simple enough. But consider that there are more than 16 billion ways to draw seven tiles out of a bag of 100. And consider that there are just shy of 200,000 valid Scrabble words. A good competitive player will have memorized a sizeable chunk of the 83,667 words that are two letters to eight letters long. A great player will know a lot of the 29,150 nine-letter words as well. The longer words are especially useful because they can be used to bingo. In Scrabble parlance, “bingo” is both a verb and a noun, and a prized one at that.2 A bingo is using all of your tiles in a turn, usually making a seven- or eight-letter word, earning 50 bonus points. A good tournament player will bingo about twice a game. A solid strategy is “20-20-20-bingo”: Try to score about 20 points a turn while keeping some good letters on your rack that will yield a bingo down the road. Competitive Scrabble tournament games are played one-on-one, with a clock. Each player gets 25 minutes to complete all of her turns, and a good player will average upwards of 400 points a game. To quantify a player’s skill, and to determine equitable divisions in tournaments, she is given a rating. A rating is based on the rating of her opponents and the outcomes of games. Win, and her rating ticks up. Lose, it goes down. Beat a much higher-rated player, and it goes up a lot. (These are akin to Elo ratings in chess, and are determined with fairly complex formulae.) The median rating of a tournament player is roughly 1200. To crack the top 100 in the country, it takes a rating of 1800. Top 10: about 2000. The annual National Championship — a 31-game marathon — is the biggest and most prestigious tournament in the country. Currently, 468 players are registered, with 92 in the elite first division, competing for the title. Ninety-one of them will be chasing Nigel Richards. Richards, who was born in New Zealand and got his start in a Scrabble club in Christchurch, picked up the game from his mother, a secretary, at the incredibly late age of 28.5 The rest of his Scrabble story is well documented. His personal story, though, is almost as obscure as the words he plays. He rarely gives interviews, and even in person lurks behind an enormous beard. Still, journalists and bloggers have uncovered a few facts. Richards is a serious bicyclist. He’s been reported to have worked for a water company in New Zealand, repairing pumps, and for a security company in Malaysia, monitoring CCTV. He moved to Kuala Lumpur, and represents Malaysia in international events. He’s reportedly an ascetic — doesn’t smoke, doesn’t drink, has no TV or radio. Chris Cree, the president of the North American Scrabble Players Association, recently related on NASPA’s Facebook page an exchange he had with Richards last month. After a tournament in Las Vegas, Richards told Cree that he’d stick around the city for a while. To do what? Cree asked. We can be sure there is at least one book Richards already knows well: the Scrabble dictionary. He is said to conjure up images of specific pages of the dictionary when recalling words. And, while he largely rejects the notion, Richards is widely said to have a photographic memory. I am a competitive Scrabble player myself — I peaked at a ranking of 223rd in the country. In the one tournament I played in where Richards competed — the 2010 Nationals in Dallas, which he won — he had an undeniable presence. But the presence is paradoxical. For all the pre-tournament hype, the rumors, the legends, and, frankly, the fear of playing Richards, he exudes utter calm. He’s been quoted saying he does not care about the outcome of his games, and that he’s just there for a “bit of fun.” He can be seen doing little other than quietly focusing on his game in progress — usually at Table 1, the table reserved for the top competitors — or quietly milling about. Emphasis on quiet. With Richards, the unremarkable is remarkable. Many top players will kibitz around a board after a game, performing a so-called postmortem. After his games are over, Richards doesn’t much care about them. 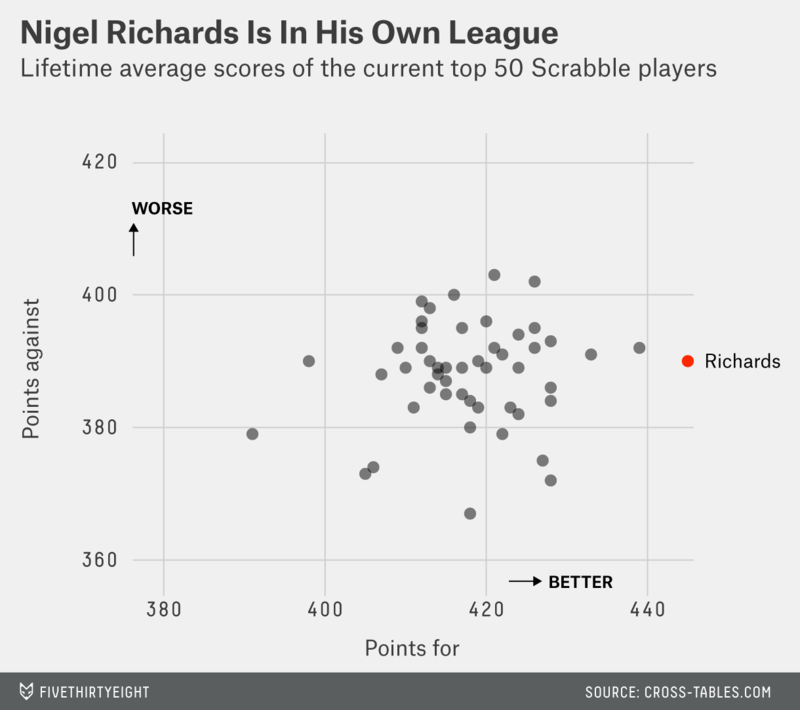 A closer look at the data may explain his unmatched Scrabble success. For living-room players, Scrabble is about language, a test of vocabularies. For world-class players, it’s about cold memorization and mathematical probabilities. Think of the dictionary not as a compendium of the beauty and complexity of the English language, but rather as a giant rulebook. Words exist merely as valid strings with which to score points. A Scrabble board after two top players are finished playing on it might look, to the uninitiated, as though they had played in Martian. Here’s a taste: In a single game in last year’s Nationals, Richards played the following words: zarf (a metal holder for a coffee cup), waddy (to strike with a thick club), hulloed (to hallo, to shout), sajous (a capuchin, a monkey), qi (the vital force in Chinese thought), flyboats (a small, fast boat), trigo (wheat) and threaper (one that threaps, disputes). Top players tend not to be novelists or poets, but more often computer programmers or mathematicians. Richards’s word knowledge is legendary — he knows the rules. As Richards told writer Stefan Fatsis, the author of the Scrabble book “Word Freak,” “I try to score points. The goal is to score more points than your opponent.” And Richards scores a lot of points. While Richards allows points on par with other elite players, he scores them by the bucketful. As a result, he averages — averages — about a 55-point win, a margin akin to the value of a bingo. This is especially incredible because, given how great Richards is, he often competes against other top players. One player, a math professor named David Gibson, wins by an average of 56 points, one point more than Richards, but scores 17 fewer points on average per game than Richards. (Gibson, as such, seems to be a more defensive player.) Only two other players, Eric Tran and Chuck Armstrong, average an more than 50-point spread. The average outcome, for the top 50 players, is a 30-point victory. 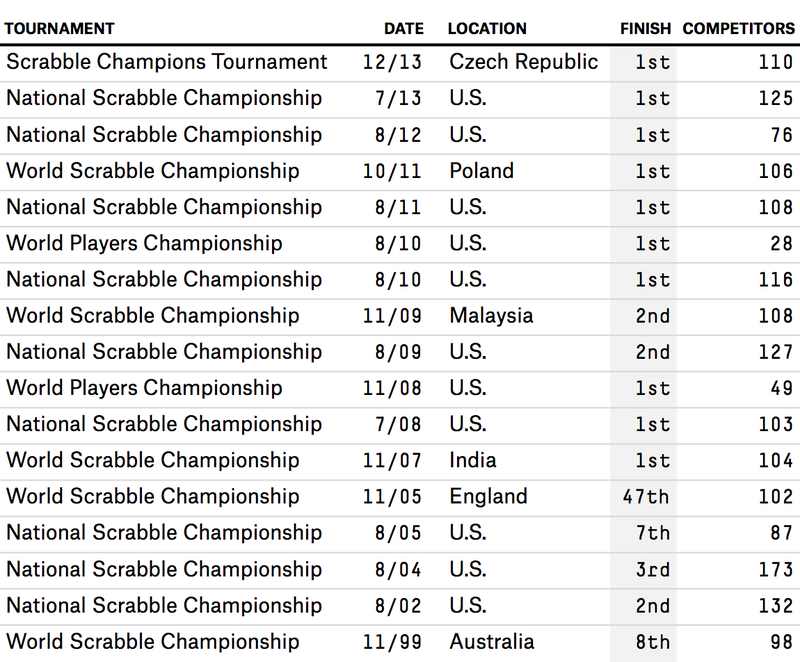 Because Scrabble tournaments cater to enthusiastic hobbyists in addition to the elite experts, almost every tournament has divisions, so that players of roughly equal skill level can compete against one another. (Only those playing in Division 1 are competing for the title of national champion, however.) The data suggests that Richards deserves a division unto himself. Here are the average scores of all the players in last year’s Nationals, both for and against. The experts in the elite divisions score more points (naturally), but they also tend to give up more points (since they’re playing against the other elite players). Richards did exceedingly well in both categories. He scored more than nearly everyone in the tournament and gave up fewer points than nearly everyone in Division 1, the top division. His average game score last year, 443 to 381, represents improvement relative to his lifetime average. His average game was a 62-point victory. So, really, how does he do it? As Richards said in an interview posted on YouTube, “I’m not sure there is a secret. It’s just a matter of learning the words.” All 178,691 of them. Well, “a preparation of varying composition containing numerous narcotic and sedative drugs,” according to Merriam-Webster.com. Irony of ironies, bingo as a verb is not recognized in the Scrabble dictionary, so one cannot have bingoed with the word BINGOED. The man-versus-machine issue is still an open question in Scrabble. While Richards’s rating is higher than Quackle’s, Quackle’s last rated tournament was in 2011, and there may be even better computer players emerging, such as Elise. Again, according to cross-tables.com. However, this number is likely low since data on prize money is not gathered for every tournament. This is especially remarkable given that another real contender for the title this weekend is Mack Meller, a 14-year-old from New York. There are two English-language dictionaries used in competitive Scrabble. Typically, one of these, the Official Tournament and Club Word List, called OWL, is used for tournaments in North America. The other, Collins Scrabble Words, called Collins, is used in English-language tournaments elsewhere, and at World Championships. Collins includes all the words in the OWL (178,691 of them), and more (270,163 total). Because Richards has played in a lot of World Championships, the extra Collins words that have been available to him in some tournaments may bias his lifetime average score upwards relative to the elite American player. However, many of the top Americans do play in World Championships and other Collins tournaments, and (most confusing of all) there is even a Collins division at the U.S. Nationals, in which some elite players do play. (Its participants, however, are not competing for the title of national champion.) But, as we’ll see, Richards scores just fine with OWL and would probably do just fine playing words out of the phonebook or a takeout menu.